Lenovo IdeaCentre K210: Desktops Are Still Cool, Right Guys? Guys? 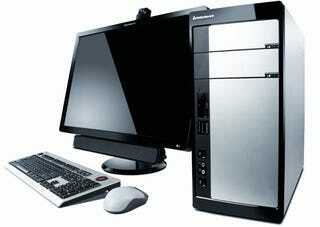 Lenovo is preparing to release a fancy new desktop, the IdeaCentre K210. Featuring specs up to an Intel Core 2 Quad processor, 3GB of RAM, optional Blu-ray drive, multicard reader, webcam with VeriFace recognition and anti-bacterial keyboard, none of the specs will scream ultimate gaming machine, but the PCs start at just $379 (with the 22-inch monitor costing an extra $299). As for the style, it's pretty much how I picture a sci-fi movie from the early '90s depicting computers of the future-shiny, but with the same basic shape they had when Sandra Bullock could pass as a hacker. Read on for the entire spec rundown. RESEARCH TRIANGLE PARK, N.C.-(BUSINESS WIRE)-Lenovo has announced the launch of the IdeaCentre K210 desktop, marking the company's global entry into the consumer desktop market outside of China. This announcement follows the recent debut of Lenovo's IdeaPad series of notebooks, which signaled Lenovo's dramatic jump into the worldwide consumer notebook business outside of China earlier this year. Lenovo's IdeaCentre and IdeaPad introductions are timely, as IDC forecasts worldwide consumer PC demand to grow by nearly ten percent a year between 2007 and 20111. The IdeaCentre K210 is designed for user comfort and convenience. For example, Lenovo is the only worldwide PC maker to offer the cutting edge "Bright Vision" technology2, which actually detects how far the user is from the monitor and adjusts the brightness accordingly. Among the new technologies the IdeaCentre K210 utilizes is VeriFace™3 facial recognition technology that allows the user to log in by having the camera recognize his/her facial image. The K210 is the only desktop PC to offer this distinctive feature. Additionally, The K210 features an anti-microbial keyboard that uses special material to inhibit bacterial growth. This is especially helpful for families that have numerous people using the same keyboard and are concerned with "keyboard germs." For ease of use and system recovery Lenovo offers the Lenovo Vantage Technology (LVT) menu. With just a single touch the user can more easily recover from system crashes or viruses. The File Management feature helps save critical data on a special system partition in the event of system failure. And for the "easy open" experience, Lenovo has built in its tool-free design which allows for easy expansion, serviceability and modifications. The IdeaCentre K210 is available on Lenovo.com, at various retail outlets in the United States and through Lenovo business partners. The starting price is $379 (after mail-in-rebate). The L195W, 19-inch monitor is priced at $229 (after mail-in-rebate). The L222W, 22-inch monitor is priced at $299 (after mail-in-rebate).